Compare Mortgage Rates with this Mortgage Comparison Calculator. See our Mortgage Rates here, and use them in this Mortgage Comparison Calculator to either compare mortgage rates from different mortgage companies, or compare mortgage rates with different home loan options. Determining which home loan provides you with the best value involves more than simply comparing monthly mortgage payments. Use this Mortgage Comparison Calculator to sort through the monthly payments, fees and other costs associated with getting a new home loan. Compare mortgage rates and programs from up to three different loan programs at the same time. By comparing these important variables side by side, this Mortgage Comparison Calculator can help you pick the home loan that works best for you. Click on the "View Report" button to see the results in detail. You may also email the results by clicking on the three-line icon in the upper right hand corner of the mortgage calculator. Looking for a different mortgage calculator? 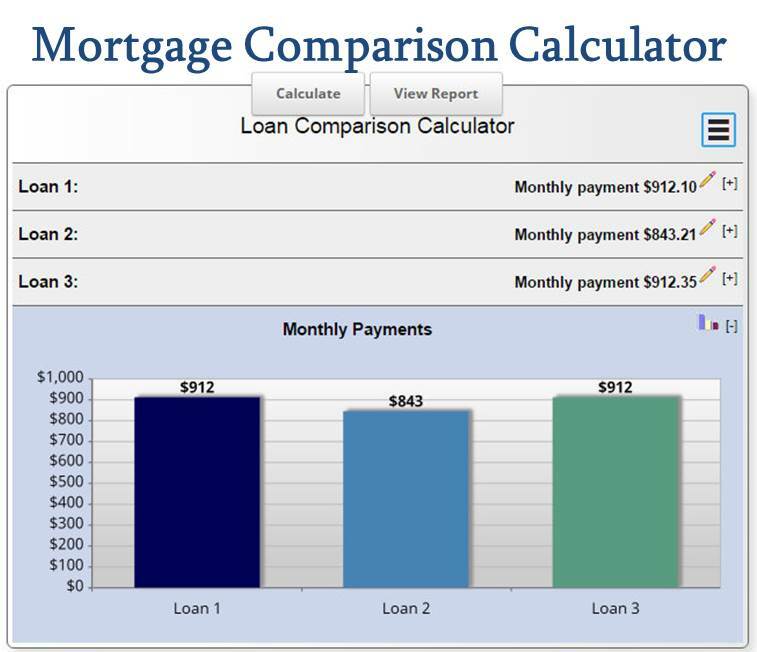 More Mortgage Calculators Here.